Sleeping on DreamCloud provides a luxurious experience that is unparalleled. The dreaminess of this high-quality mattress has caught the attention of popular review sites that can’t get enough of its affordable price, lifetime warranty, 8 layers of plush memory foam, Cashmere blend fabric top layer, and patented spring coils. The 365 night trial (with free returns and shipping) will make sleep come that much easier when you don’t have to stress about making a big decision right away. Hardly a fair comparison to other options on the market, we’ve compiled a list of differences between the luxury brand DreamCloud and The New Purple performance mattress. DreamCloud offers a premium mattress made with top of the line materials without the pricetag of a standard luxury mattress. Its 8 unique layers of super soft memory foam have been carefully constructed in order to make your sleeping experience as comfortable as possible. The main difference in construction between DreamCloud and The New Purple mattresses is the Purple Smart Comfort Grid, which is a polymer-based purple grid that rests just below the surface of The New Purple mattress vs DreamCloud, which has 5 layers of super soft, cooling, memory foam and natural latex in between the top layer of the DreamCloud mattress. DreamCloud has a foam-encased micro coil compression system in DreamCloud, whereas there is only a one layer between your body and the polymer Purple Smart Comfort Grid on The New Purple mattress. After this plastic grid there is only one more layer until the coils. According to popular review site Sleepsherpa.com, they “recommend the DreamCloud to people that want a traditional mattress feel will all the benefits of newer generation foams and latex along with the tried and true benefits of tufting that only a luxury mattress can offer.” When speaking of The New Purple, on the other hand, Sleepsherpa.com said that it “is a Goldilocks mattress in the sense that you get great support and contouring. However it isn’t a mattress that feels “cozy” or will hug you.” DreamCloud will always give you that just right kind of feeling that you are floating on a plush cloud. A True Tufted Cashmere Blend EuroTop: This high quality, super soft top is unmatched in breathability and softness. Plus, the tufted top makes it feel as though you are actually sleeping on a fluffy, white cloud. Gel-Infused Memory Foam: Cooling and supportive, this layer not only perfectly contours to your body but also maintains a snug, neutral temperature as you drift off into dream world. Super Soft Quilted Memory Foam: This layer only adds to the cozy quality of DreamCloud. This super soft layer is unique to the DreamCloud brand and was designed with lullabies in mind. Supreme Natural Latex: DreamCloud’s premium natural latex layer provides a cushioning bounce with some added give that contours seamlessly to your body. “Dream Plush” Supporting Memory Foam: High density memory foam providing boundless amounts of support throughout the night. Super Dense Super Soft Memory Foam: Also all about support, this layer is meant to eliminate strain on your back and keep your body in alignment no matter what sleeping position you prefer. Patent-Pending “BestRest” Coils: This five-zoned foam encased micro coil compression system is unmatched in the field and will send you to dreamland in no time. High Density Super Soft Memory Foam: Beautifully crafted high density foundation foam that keeps your back in alignment. DreamCloud and The New Purple are fairly close in price; the queen-sized DreamCloud mattress is $1,299 and the queen-sized New Purple mattress comes in at about $1,599. Compared to other performance mattresses on Sleepsherpa.com, The New Purple is the priciest, coming in at an 8.3 out of 10 on the affordability scale as rated by Sleepsherpa.com. DreamCloud, on the other hand, is rated as a 9.5 out of 10 on the affordability scale by Sleepsherpa.com making it not just an affordable mattress compared to its luxury mattress competitors, but blowing The New Purple out of the water. According to www.sleepsherpa.com, with other luxury mattresses made with the same quality and features as the DreamCloud “you can expect to pay north of $5,000”. A very important thing to note about The New Purple is that the prices really skyrocket when you go from the model with the two inch polyurethane Purple Smart Comfort Grid, to the three inch model, and then to the four inch model. The $1,599 price tag is only for the two inch Comfort Grid at a queen size. If you want to bump up your purchase to the most comfortable version of the The New Purple, you’d need either the three inch or four inch model, which come with much higher price tags of $2,199 and $2,799. Purchasing a mattress is not only a monetary investment, but also an investment in the time and energy to coordinate delivery and set up in your home. With DreamCloud we take care of the hassle for you. DreamCloud’s exceptional, world-class customer service team is dedicated to making your life easier. Our Sleep Concierge Team will help you coordinate your purchase or in-home trial as well as answer any questions you may have about DreamCloud. If you choose, we will hand deliver your mattress via our White Glove Service, set it up in the room of your choice, remove all of the packaging, and also remove your old mattress at no additional cost. The New Purple also offers a White Glove Service for delivery, but it hasn’t been chosen as the Editor’s number one choice on GetBestMattress.com like DreamCloud. The DreamCloud mattress received an overall rating of 9.4 from GetBestMattress.com compared to The New Purple’s 8.4 rating from GetBestMattress.com. This took into account design, comfort, value for your dollar, and top of the line customer service. Accordingly to Getmemoryfoam.com, DreamCloud is the winner. DreamCloud understands the importance of taking your time to make the best decision for you, which is why you can take DreamCloud home with you on a risk-free trial period for an entire year. Yes, you read that correctly. Our trial period is 365 nights. Unlike The New Purple mattress that offers a trial period of only a few months, DreamCloud allows you to test out your mattress throughout every season. For less money and with better reviews you can test out a luxury quality mattress for longer and without any risk. Now that’s the stuff that dreams are made of. At DreamCloud, we offer an Everlong warranty. This is a guarantee that as long as you use and own the mattress, it will be free from defects in workmanship and materials. In comparison, The New Purple only offers a 10 year warranty, meaning that not only will you pay more on average for The New Purple, but your warranty is only for a limited time. Popular review site Sleepsherpa.com raved about DreamCloud mattress. “The DreamCloud is hands down one of the best values out there for a mattress” and that they “haven’t come across a mattress that is built better than the DreamCloud at this price point,” they stated in their review. Sleepsherpa.com gave DreamCloud an overall rating of 9.3 out of 10 compared to an overall rating of 9 out of 10 for the New Purple, which took into consideration everything from price and warranty to design and comfort. According to review site GetBestMattress.com The New Purple is a good mattress for individuals over 150 pounds who prefer to sleep on their backs. However, GetBestMattress.com states that “if you are a side sleeper and light guy, I don’t think you will have a very good sleeping experience [and] it may make your hips and shoulders hurt.” In contrast, GetBestMattress.com said of the Dreamcloud that it is “a Luxury Firm mattress, providing you with the same comfort as luxury hotels do.” DreamCloud’s combination of plush Cashmere blend cover, patented coils, and premium memory foams provides an ideal level of firmness and support. Both DreamCloud and Leesa Sapira are hybrid mattresses that mix the comfort of foam The New Purple does not have memory foam included in their mattress design and build. This means that DreamCloud takes the cake in terms of sumptuous memory foam comfort. DreamCloud has not one, not two, but five layers of memory foam to ensure maximum comfort, lulling you into a blissful, supportive sleep. It’s part of what allows DreamCloud to offer a luxury hotel sleeping experience where the mattress forms to your body. Memory foam was first developed by NASA and has been used for mattresses for years with tried-and-true results for contouring comfort. The New Purple uses a polymer-based material that hasn’t been in the industry that long. No one likes to feel uncomfortable when they sleep and sleeping hot is one of the easiest ways to ruin the quality of your sleep. According to popular review site GetBestMattress.com, “the most prominent problem with most memory foam mattresses is that they tend to trap heat inside them and thus result in the user feeling hot while they sleep. 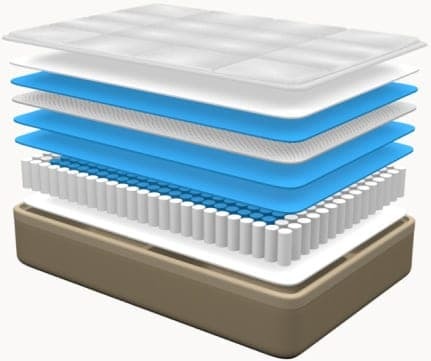 A memory foam with gel infusion has a special cooling gel that keeps it cool while you sleep.” DreamCloud is made with a gel infused memory foam layers that is close to the surface of the mattress. This translates to staying cool and well-supported throughout the night. The DreamCloud mattress also has a unique feature in its Cashmere Blend top. Cashmere is one of the most expensive fabrics in the world due to its luxurious feel. This fabric is naturally moisture-wicking meaning that it will keep you cool in the summer and warm in the winter. The New Purple mattress has the Purple Smart Comfort Grid, which claims to keep the mattress a neutral temperature, but it does not have the gel memory foam mattress or the same cashmere-blend top as DreamCloud. Motion transfer refers to the amount of movement that is felt from one side of the bed to the other. This is something to take into serious consideration especially for co-sleeping purposes. Minimal motion transfer is something that DreamCloud spent a lot of attention on in order to create the perfect mattress for a variety of sleepers. Because of DreamCloud’s hybrid design of premium memory foam and foam encased pocketed micro coil compression system, motion transfer is nonexistent with DreamCloud. Sensitive sleepers who wake up easily will love this about DreamCloud, especially if they or their partner is someone who tosses and turns. The New Purple’s Purple Smart Comfort Grid also offers motion-isolating technology, but not in the same luxuriously fashioned encasement as DreamCloud. Reviewers are loving DreamCloud and we can’t blame them. The reviewers at Memoryfoamtalk.com rave that, “ the DreamCloud is extremely comfortable, and is the most comfortable hybrid mattress (or any mattress honestly) that [they] have tested to date.” At GetBestMattress.com they are saying that “the DreamCloud Mattress is an excellent choice if you wish to have a premium hotel-like experience,” and we couldn’t agree more. Finally, Sleepsherpa.com says it best when they say that they “recommend the DreamCloud to people that want a traditional mattress feel will all the benefits of newer generation foams and latex along with the tried and true benefits of tufting that only a luxury mattress can offer.” We couldn’t have said it better ourselves. If you want a truly expensive-feeling, quality created, lush sleeping experience at a low cost compared to others on the market, DreamCloud is the mattress you want. DreamCloud is upping the ante in the mattress industry with its unique blend of high quality memory foam layers, hybrid coil support system, plush cashmere cover, and impeccable quality. You won’t find another mattress with this quality for this price. With The New Purple, however, you’re paying a much higher price. If you want to feel like a pampered prince or princess in a luxury suite, there’s no question. It’s got to be DreamCloud.